When [millerman4487] bought a TCS230-based color sensor, he was expecting a bit more documentation. Since he didn’t get it, he did a little research and some experimentation and wrote it up to help the rest of us. The TCS3200 uses an 8×8 array of photodiodes. The 64 diodes come in four groups of 16. One group has a blue filter, one has green and the other has a red filter. The final set of diodes has no filter at all. You can select which group of diodes is active at any given time. Sixteen photodiodes have blue filters, 16 photodiodes have green filters, 16 photodiodes have red filters, and 16 photodiodes are clear with no filters. The four types (colors) of photodiodes are interdigitated to minimize the effect of non-uniformity of incident irradiance. All photodiodes of the same color are connected in parallel. Pins S2 and S3 are used to select which group of photodiodes (red, green, blue, clear) are active. The output of the array is a frequency that corresponds to the light intensity measured by one bank of photodiodes. You’ll need to make several pulse input measurements to compute the color and [millernam4487] provides code for it. You may, however, need to calibrate the device before you get good results. We’ve looked at color sensors before, of course. They can even unlock doors. More often than not, our coverage of projects here at Hackaday tends to be one-off sort of thing. We find something interesting, write it up for our beloved readers, and keep it moving. There’s an unending world of hacks and creations out there, and not a lot of time to cover them all. Still, it’s nice when we occasionally see a project we’ve previously covered “out in the wild” so to speak. A reminder that, while a project’s time on the Hackaday front page might be fleeting, their journey is far from finished. A perfect example can be found in a recent article posted by the BBC about the battle with noise in Barcelona’s Plaza del Sol. The Plaza is a popular meeting place for tourists and residents alike, with loud parties continuing into the middle of the night, those with homes overlooking the Plaza were struggling to sleep. But to get any changes made, they needed a way to prove to the city council that the noise was beyond reasonable levels. 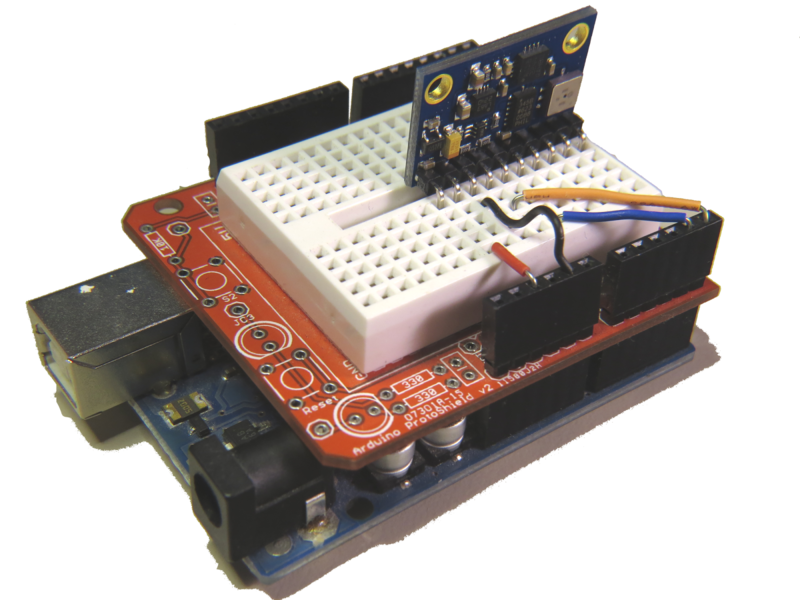 Enter the Smart Citizen, an open source Arduino-compatible sensor platform developed by Fab Lab Barcelona. We originally covered the Smart Citizen board back in 2013, right after it ran a successful funding campaign on Kickstarter. Armed with the data collected by Smart Citizen sensors deployed around the Plaza, the council has enacted measures to try to quiet things down before midnight. Today people tend to approach crowdfunded projects with a healthy dose of apprehension, so it’s nice to see validation that they aren’t all flash in the pan ideas. Some of them really do end up making a positive impact, years after the campaign ends. Of course, we can’t talk about distributed environmental monitoring without mentioning the fantastic work of [Radu Motisan], who’s made it his mission to put advanced sensors in the hands of citizen scientists. With CNC machines, getting the best results depends on knowing how fast your tool is moving relative to the workpiece. But entry-level CNC routers don’t often include a spindle tachometer, forcing the operator to basically guess at the speed. This DIY optical spindle tach aims to fix that, and has a few nice construction tips to boot. The CNC router in question is the popular Sienci, and the 3D-printed brackets for the photodiode and LED are somewhat specific for that machine. But [tmbarbour] has included STL files in his exhaustively detailed write-up, so modifying them to fit another machine should be easy. The sensor hangs down just far enough to watch a reflector on one of the flats of the collet nut; we’d worry about the reflector surviving tool changes, but it’s just a piece of shiny tape that’s easily replaced. The sensor feeds into a DIO pin on a Nano, and a small OLED display shows a digital readout along with an analog gauge. The display update speed is decent — not too laggy. Impressive build overall, and we like the idea of using a piece of PLA filament as a rivet to hold the diodes into the sensor arm. Want to measure machine speed but don’t have a 3D printer? No worries — a 2D-printed color-shifting tach can work too. There are plenty of PC joysticks out there, but that didn’t stop [dizekat] from building his own. Most joysticks mechanically potentiometers or encoders to measure position. Only a few high-end models use Hall effect sensors. That’s the route [dizekat] took. Hall effect sensors are non-contact devices which measure magnetic fields. They can be used to measure the position and orientation of a magnet. That’s exactly how [dizekat] is using a trio of sensors in his design. The core of the joystick is a universal joint from an old R/C car. The center section of the joint (called a spider) has two one millimeter thick disc magnets glued to it. The Hall sensors themselves are mounted in the universal itself. [Dizekat] used a small piece of a chopstick to hold the sensors in position while he found the zero point and glued them in. A third Hall effect sensor is used to measure a throttle stick positioned on the side of the box. An Arduino micro reads the sensors and converts the analog signal to USB. The Arduino Joystick Library by [Matthew Heironimus] formats the data into something a PC can understand. While this is definitely a rough work in progress, we’re excited by how much [dizekat] has accomplished with simple hand tools and glue. You don’t need a 3D printer, laser cutter, and a CNC to pull off an awesome hack! If you think Hall effect sensors are just for joysticks, you’d be wrong – they work as cameras for imaging magnetic fields too! [Pawel] has a weather station, and its nerve-center is a Raspberry Pi. He wanted to include a light sensor but the problem is, the Pi doesn’t have a built-in ADC to read the voltage off the light-dependent resistor that he (presumably) had in his junk box. You can, of course, buy I2C ADC chips and modules, but when you’ve already got a microcontroller that has ADC peripherals on board, why bother? [Pawel] wired up a tremendously simple circuit, downloaded some I2C slave-mode code, and added an LED for good measure. It’s all up on GitHub if you’re interested. Bright by Day, Dark by Night! We’re covering this because we rarely see people coding for I2C slave devices. Everyone and their mom uses I2C to connect to sensors, for which the Arduino “Wire” library or “i2c-tools” on the Pi do just fine. But what do you do when you want to make the I2C device? [Pawel]’s project makes use of TinyWireS, a slave-mode SPI and I2C library for AVR ATtiny Arduino projects. In this tutorial, I will show you how to configure and extract data from the magnetometer (HMC5883L) sensor on the GY-80 10DOF module from ICStation. While there are some very good libraries on the internet which will give you full access to this sensor, I will show you what you need to know without using a library. This means that it may get a bit technical at times, but I will hold your hand along the way and provide explanations as required. I would also recommend that you watch the complete video from start to finish - as the video provides really useful information. This tutorial does not use any external libraries. It does use the Wire library for I2C communication. However, there is no extra download required to access the Wire library. Like I said - you do not need an HMC5883L library for this tutorial. The libraries above are listed for those who wish to learn more about this particular sensor. The Arduino IDE can be downloaded from the Arduino website. Visit the Arduino IDE download page. I generally use the ZIP file for Windows and never seem to have any issues. There are downloads available for all the major operating systems. This code will set all axis values to 1000 upon startup. Moving the GY-80 module around will result in a value greater or less than 1000, however, returning the sensor back to it's original position, should result in values very close to 1000 on each axis. I chose to introduce this calibration in order to avoid negative values, and I liked the fact that I could set a heading with values that were easy to remember. The magSetting function was created to easily configure the magnetometer. Make sure to look at the video and also the datasheet for further information about calibrating the magnetometer. The getReadings function was created to easily retrieve the magnetometer axis data. I chose to use Single measurement mode in this tutorial. You can communicate with any of the sensors on the GY-80 module using I2C. 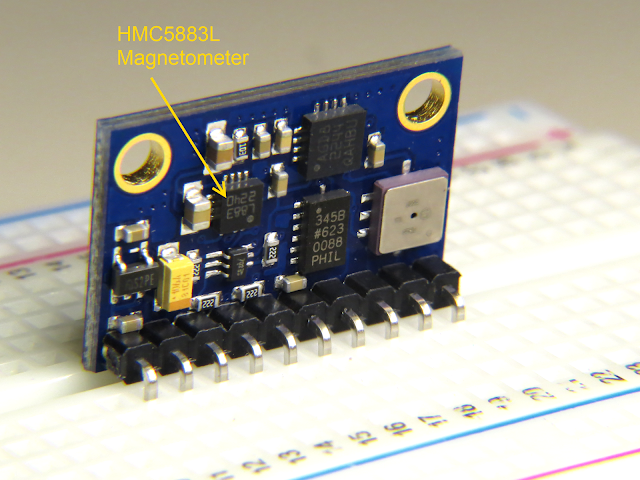 The HMC5883L magnetometer sensor is no different. You will need four connections between the Arduino UNO and the GY-80 module. Have a look at the diagram below for the connection diagram and table. The HMC5883L sensor on the GY-80 module is quite interesting and works relatively well. There are a number of other sensors on the GY-80 module which can provide complementary positional data. At some point, I plan to come back and explain some of the other sensors on this module, but first I would like to create a real-life project using the magnetometer. So stay tuned. You may want to subscribe to my social networks or to this blog to be notified of that project when I complete it. I would like to thank ICStation for their collaborative efforts. Their contribution was invaluable to this tutorial's existence.